Gllitter Gal: Flash Sale - Week 2 - Be Glossy In and Out! 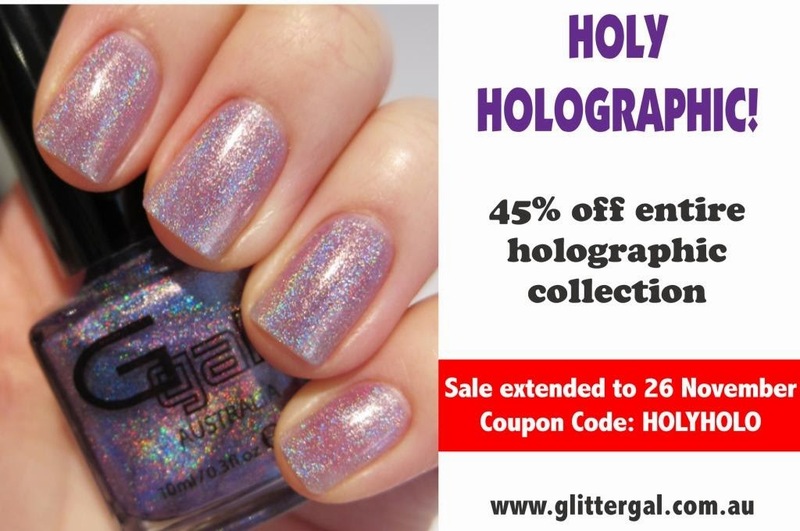 Hmm, this week Glitter Gal Australia will be offering a massive 45% off Glitter Gal holographic range. Hurry up!! All Glitter Gal Australia’s polishes are 5 free and do not contain Formaldehyde, DPB, Toluene, Formaldehyde Resin or Camphor. I'm sorry if I'm disturbing you. And I would be grateful if you took the time to look at it. Thank you!